The Banished One, a serial killer vampire also named Lucius, is still wreaking havoc on the sleepy town in Tower City, and since he’s supernatural he can’t be captured by normal police procedure. A frustrated Lieutenant Welby refuses to believe that the elusive Lucius, the one responsible for those dead bodies in his town, is a vampire; that defies logic. There’s got to be another explanation for those fang marks in the victims’ throats. Welby remains a staunch disbeliever in vampires until the coroner, Doc McMahon, causes him to change his mind! Doc shows Welby his ancestral journal from the 1700’s regarding Quentin Castle, the father of all vampires. Welby is whisked back in time as he reads those yellowed pages filled with encounters of beautiful women being lured to their mortal doom and transformed into vampires by the handsome and charming Quentin. But what causes Welby to finally be convinced, is a series of preternatural events and the coroner’s scientific evidence! Welby then follows the old town rumors about vampires right to Quentin and his gothic castle to enlist Quentin’s supernatural aid in capturing Lucius. Will Quentin, the only one who can stop Lucius’ vampire tirades, help the Lieutenant or make him one of The Undeparted? Will Quentin battle Lucius and send Lucius to the bowels of hell for eternity, finally ensuring that Cassandra is safe from her old beau? Will the old coal mining town be safe at last? THE BANISHED ONE ~ Coming December 2012! 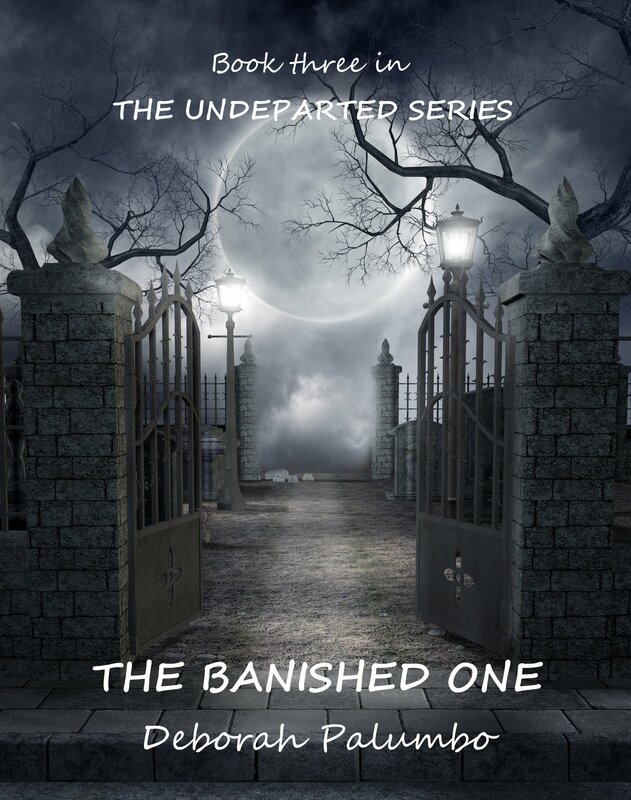 This entry was posted in Author Spotlight, Authors, Book Release, Books, Cover Reveal, Paranormal and tagged Authors, Book Release, Books, Deborah Palumbo, Paranormal, Reading, The Banished One, The Undeparted Series by Mae Clair. Bookmark the permalink. THANKS FOR THE CPVER REVEAL. MAE! I ALWAYS ENJOY YOUR BLOG AND BEING A PART OF IT! Very eye-catching cover! I love the sense of mystery and forboding. We know immediately that we are in for a supernatural read. Love the way the enormous moon is framed by the open gate, inviting us to our doom. The gas lamps are an added bonus, as I love old gas lamps like those. The gravestones are well-placed, sort of peering in from the sides, barely visible. After seeing this, I would love to see the other covers. Is the author self-pubbed? If so, who does she use for covers? I’m with you on the sense of mystery and forboding. You just know it’s going to be a good spooky read. I love old gas lamps too (the Sherlock Holmes addict in me, LOL). Deborah does indie pub but I’m not sure who she uses as a cover artist. I’m sure she’ll pop back on later to check comments and share her experience about finding the perfect cover. Thanks so much for visiting and commenting! Thank you so much for your wonderful reply! I am a self pubbed author on aamazon. http://www.deborahpalumbo.com will direct you to my amazon book page and blog. You can check out the other covers while you’re there. Gees now I can’t wait to hear back form you! Love the cover! Sounds great! Always happy to see you, L.J.! Many thanks for dropping by. I agree ~ the cover for THE BANISHED ONE is gorgeous! Thanks Laura. I appreciate you stopping by; glad you love the cover!! Ooh, this is a beautiful cover. Isn’t it, Jessi? I just love doing cover reveals and really liked the moody ambiance this one inspired. I just love to hear that Jessi. Thanks so much! Nice to meet you. Hope you’ll catch up on the series. Check that…Deborah’s books…as this is the third in a series. Yep, book 3 in THE UNDEPARTED series. I can completely relate to that must-read list, Kitt. Mine is a three headed hydra that keeps multiplying, LOL! Ooh, a three headed hydra reference. Good one! Thanks Mae for enticing Kitt for me!! And Kitt, please do add me to your MRL. There’s time to catch up on the series as The Banished One is coming Dec 1. The Undeparted will be free ladies 11/17 n 11/18, on Amazon…spread the word Mae and new friends! !